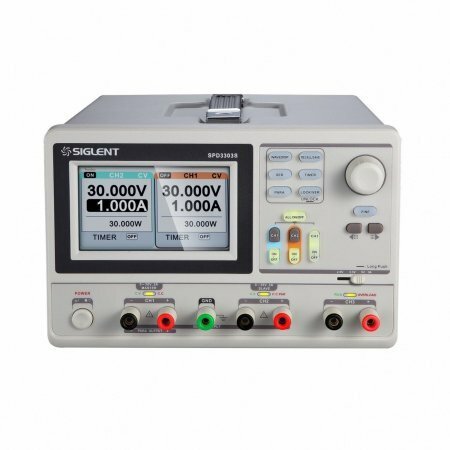 This DC power supply allows users to programme the exact parameters they need and features multiple channels with varying voltage/current ranges and maximum output power of 195W. The minimum voltage of this product is 1mV, 1mA. One of the main benefits of this device is the inclusion of the extremely high quality colour LCD screen that’s integrated directly into the device. This enables users to easily gain extremely high quality images and parameters can be adjusted with ease using the dials and buttons to the right of the screen. The screen is 4.3 inches in size, and displays data as a high quality 480 x 272 pixel image. The SPD3303S also features separate control and independent triple outputs: 30V/3A*2, 2.5V/3.3V/5V/3A*1, total 195W power. It also includes three output modes: independent, series and parallel connect.